A bold decision from the client NOT to go with Search Consultants and focus on the employer brand building and PR benefits of a creative recruitment advertising campaign, led to this highly successful and award-nominated campaign by WDAD. In the summer of 2015 the organisation had an interim Executive team and needed to appoint a full-time CEO as the first part of a process that would see a full-time Exec team in place over the next 12 months. 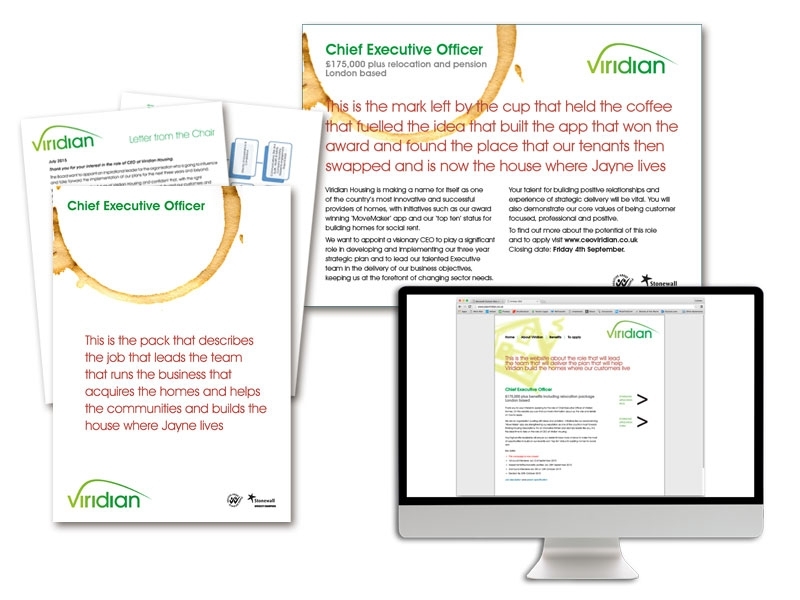 The were also recovering from a rather public ‘failed’ merger with another Housing Association – and though Viridian had emerged from that painful process with a better understanding of its strengths and weaknesses they needed positive PR to offset any lingering negative perceptions, both internally and externally. One particular initiative that caught our attention was Viridian’s award-winning ‘home-swap’ app called MoveMaker, designed to help their tenants ‘swap’ homes on a platform similar to the popular dating site ‘Tinder’. We decided to reference this initiative as an example of just one of the many projects devised and implemented by Viridian. We wanted to show Viridian as a creative force and not just and organisation that ‘puts roofs over peoples’ heads’. After the briefing we devised a creative concept that used the children’s nursery rhyme ‘This is the house that Jack built’ as it’s style, changing the words to reflect both the creative thinking process at Viridian and to demonstrate the benefits to the residents of that process. (And after much debate, ‘Jack’, became ‘Jayne’ to make the message more slightly more PC!). The theme was continued across all aspects of the campaign; including a campaign microsite (‘This is the website …’) and the application packs (‘This is the pack …’) all produced by the agency in the same design. The response to the campaign – both through applications to the role and positive comments to the board – was excellent. From over 40 returned application packs, the Board at Viridian were able to interview a shortlist of five high quality candidates and a successful appointment was made in the Autumn of 2015. This positive theme has continued since – and the organisation has now entered new merger discussions with their new CEO very much at the helm of that process. As well as offering a fantastic ROI, the whole employer branding / advertising campaign was nominated for a creative award at the 2016 PPMAs where it received a special commendation.